In 2018 the South East Counties got together and ran the inaugural South East Team Trophy 16 & Under Event. The aim of this competition is to increase the provision of Team Matches during the year and keep players within tennis during the age group where there is a high dropout rate. A fun but competitive event was held alongside the Finals weekend of the Surbiton Trophy (won in 2018 by Jeremy Chardy, Men’s and Alison Riske, Ladies) on their wonderful Grass courts. In addition to the Team Trophy, we organise friendly matches against local counties ahead of County Cup Competitions with a mixture of County Cup format and Doubles only tournaments being played. The Friendly matches give practice matches especially for our Younger players who don’t necessarily have a lot of team experience, a chance to try out different doubles pairings in practice for County Cup as well as give players who may not make the team a chance to represent Middlesex. In 2018, we played Surrey, Cambridgeshire and Oxfordshire. For 2019, we are planning more matches throughout the year. 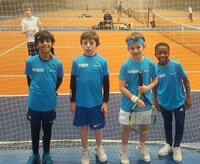 Success for Middlesex at 16U Boys South East Team Trophy. Very competitive matches with most lasting 1 hour+ and a 3-way tie between Middx, @tennisinsussex & @kent.lta !!! Middlesex just taking it on set % won 59% . @tennisinsussex a close 2nd with 55% and @kent.lta in 3rd with 53%. Well played to @surrey.tennis who were very close to making it a 4-way tie!! Thank you Sandi and Roy for making it happen!